Some months back, GS Wiley posted a prompt picture and challenged her readers to craft a story to go with it. About 1600 words later, I had the bones of a story, but put it aside for other projects. Then, the call came out from the GLBT Bookshelf (click on that tall banner on the right to see what a cool place that is!) that they would be hosting a page dedicated to free reads. Ah hah! The perfect moment to bring out that little prompt fic and finish it properly! But since everyone else offering stories there so far has offered something lovely and professionally packaged, that left me with the need for a proper cover. Photoshop and I are not friends. Photoshop and I are not even on speaking terms, if the truth be told, but I do know someone for whom Photoshop is a best buddy, and Jared, being the sweet person and artist that he is, came through. He took a tiny picture and some incoherent explanations and produced this. 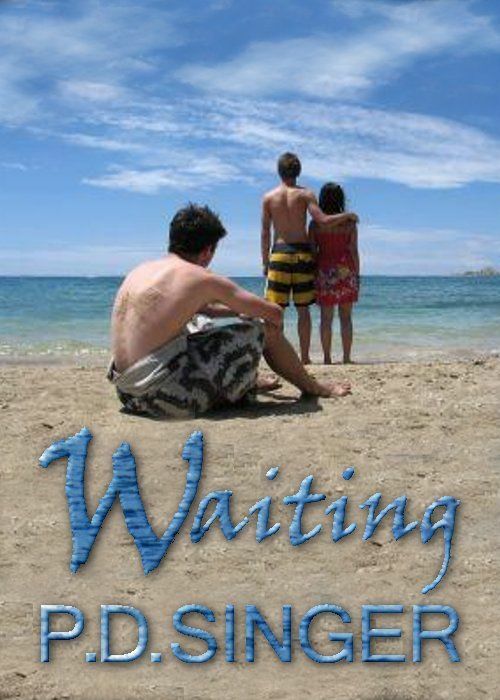 “Waiting” will be available soon as a PDF for download, free, through the GLBT Bookshelf, and I’ll post a link when it’s live. In the meantime, enjoy! This entry was posted in Free read, Jared and tagged Jared. Bookmark the permalink. Nice cover. 🙂 Where’d you get the pic(s)? I’ve never looked at the whole fee/royalty thing at the stock photo sites, so I have no clue exactly how that works. This is a royalty free pic, one fortunately, that I bookmarked during one of those miserable searches through scads of badly tagged pictures. You have an account, and pay a flat fee for so many credits, and then spend the credits on the pics. Jared, being a pro, has accounts at a couple of these places. I could just tell him which pic and where. Coolness, thanks. [nod] I’ll keep that in mind in case I ever want to try this sort of thing. Jared is da man! Love his covers and can’t wait to see them gracing best sellers! I was fortunate enough to get a sneak peek at Waiting, and it’s a lovely little story.